Get excited! It’s nearly payday and a long weekend is fast approaching, and just in time for all of the celebrations, our March favourites edit is finally here! Does anyone else have a month or two in the year where EVERYTHING seems to happen? March is one of mine. With a dozen birthdays, Mother’s Day and my first wedding anniversary all within a few short weeks, it feels like March has gone past in a rush of noise and cake. My favourite beauty bits have had their work cut out for them this month – they’ve kept me looking put together despite feeling anything but! My baby boy is still waking up a few times a night, so my dark eye circles can currently be seen from space! As concealing alone isn’t doing the trick I’ve been on the hunt for a colour corrector that doesn’t pull any punches on the coverage front. With all things considered, the Vichy Dermablend Colour Corrector in Apricot could potentially be a new holy grail for me. I pat the creamy formula on sparingly (it’s pretty concentrated in pigment, so sometimes I mix a little with my eye cream), and I follow with my favourite concealer for a flawless finish.There are four shades available to suit all sorts of issues, but Apricot is the one to go for to counteract blueish dark circles like mine. Black XS, to me, is a bit of a quiet classic. First launched at a time when fruity floral fragrances were everything, it’s lasted the test of time as an amazing example of its genre. 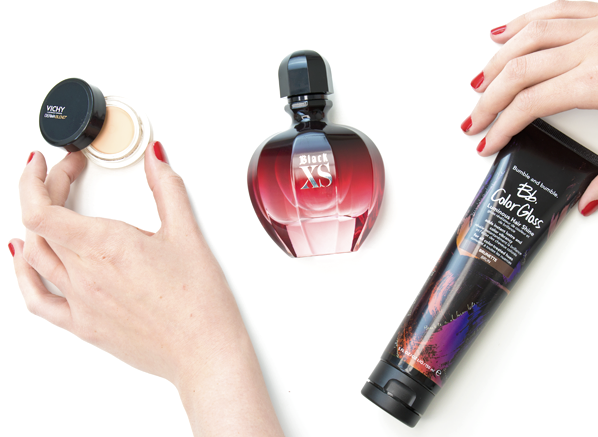 This month, Black XS is being treated to a thoroughly 2018-appropriate makeover with a brand new bottle and a more concentrated juice that gives you even more of that addictive combination of tart cranberry, moody Hellébore rose and creamy vanilla. It’s one I always come back to. I’m not one for lots of hair products, but I’ve recently cut my hair and I’m loving the way it’s looking for the first time in a long time. It’s making me want to give it lots of treats. The first on my to-try list this month is a triple-threat: the Bumble and bumble Colour Gloss, a temporary tint that gives your colour a boost whilst also amping up its glossiness and softness. I slathered it on using the provided gloves, left it for 20 minutes and then rinsed away, easy peasy. After blowdrying, my hair looked like I’d just left the hairdresser. Minimum effort for maximum result! Tip: The Brunette version has got a warm undertone to it, so if you like to keep your dark hair on the cooler side of the colour spectrum it might be worth checking out the Clear version, or even Cool Blonde (it’s got a cool violet tint, but it won’t turn your hair violet!). March has been anything but boring. I turned 25, attended a number of exciting events and went on a romantic trip to Venice with my boyfriend. It’s been a busy month but thrilling nonetheless, and the beauty items I’ve loved have all played a big part in making me look and feel my best during such a special time. Whenever I travel I always choose my fragrance carefully. After all, once you’re home that scent will remind you of that place for years to come. For my Venice trip I chose Prada La Femme L’Eau, a floral oriental with notes of frangipani and vanilla. I knew this was the one when I read our fragrance writer, Thomas’ review. He described it as a “glistening floral that is evocative of a summer’s day” – I couldn’t think of anything more fitting for a spring trip to Italy. Tip: When I travel I always use a Travalo, it saves space and also means your beautiful fragrance bottles aren’t at risk of breaking. The weather has been a little tempremental in the UK as of late. One day it’s a snow storm and the next it’s the most perfect spring day. Although this has done wonders for my mood (I hate the UK’s usual gloomy forecast) it has not done wonders for my lips. The constant transition from freezing cold to indoor heating have made lip balm a necessity for me this month and my nourisher of choice has been Hydrabloom. More than a lip balm, this is a pH adapting formula that’s worked wonders for me. You can hear me rave all about it here. One swatch of the Synchro Skin Illuminator in Pure Gold was all it took to knock me off my feet. It’s a water-based illuminator infused with subtle shimmer that instantly lights up the complexion (just what I needed after a busy month!). If you’re all about highlighter and on the lookout for your next one, then I highly recommend this. Benefit launches always excite me, especially when they’re Box O’ Powders (those who love Hoola and Dandelion Twinkle will understand my elation)! In keeping with the healthy glow trend, this golden nugget has brightened up my skin with its subtle golden sheen and soft nectar shade. 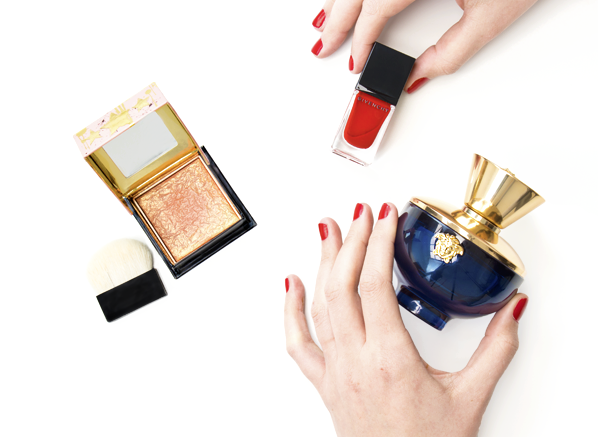 Plus, every time I wear Gold Rush it smells like a tropical getaway, so its like a reminder that summer’s coming when it’s on my skin – I just love it! I never expected to love Versace Dylan Blue Pour Femme, but how could I resist that bottle? Delicate, but strangely empowering, its ultra-feminine composition isn’t usually my style, but during my spring beauty transition I’m rather enjoying its fresh-floral-fruitiness. Just like the woman it was created for, it’s typical Versace, demure and strong. I think Emma describes the scent perfectly in this review. Givenchy will always have a special place in my heart, and so will the shade Carmin Escarpin (inspired by a powerful red pump heel). When I say I’m obsessed with this colour, I mean it; I already have the lipstick, so I obviously needed the nail varnish to match. Transforming my nails from boring to glamorous with gel-like shine, its quick-drying formula fits in perfectly with my predominantly black wardrobe and last-minute lifestyle. This entry was posted on Friday, March 30th, 2018 at 5:30 pm and is filed under Bath & Shower, Essentials, Fragrance, French Pharmacy, Haircare, Make-up, Monthly Favourites, New products, Skincare, Tried & Tested. You can follow any responses to this entry through the RSS 2.0 feed. You can skip to the end and leave a response. Pinging is currently not allowed.